This installed set is driven directly by the drive engine of the vehicle via the auxiliary power take-off. If power is required while parked, engaging the auxiliary power take-off increases the engine speed a little, so that the auxiliary power take-off has an output speed of 1000 -1 rpm. This is transmitted via the drive shaft to the planetary gearbox seated directly on the generator. The gearbox converts the speed to the 3000 -1 rpm required by the generator. Once the auxiliary power take-off has started, the required electrical power can be accessed from the power outlets mounted in the vehicle. GTS provides underfloor installation kits for mobile power generation in commercial vehicles. The applications are many and varied, whether for cooling systems or fully autonomous power generation in promotional vehicles with stages, lighting, and amplifiers. 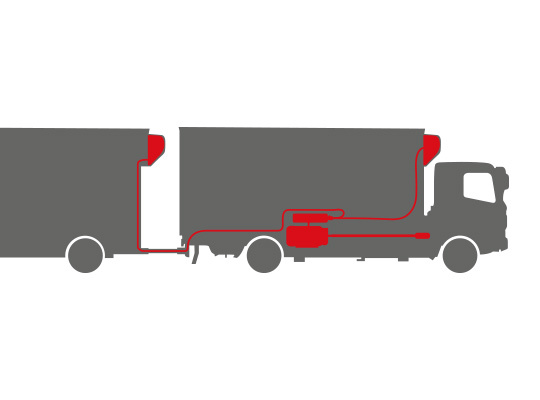 For each area of application, GTS has the perfect solution for mobile power generation in commercial vehicles. Anyone who use to need to transport a bulky mobile power supply unit in order to have power on site will find the GTS commercial vehicle power plants to be a cost-saving, high-performance alternative.